So, as we covered in the previous analysis summary for Gold/USD, we managed to call the latest bottom area for Gold/USD fairly well, almost to the day, and with an insignificant price difference, back in the final days of December 2016. Initially, our target was $1200-1220, of which $1200 was hit on the 12th of January 2017. Next call we made was a minor warning on the 18th of January, that Gold/USD was overbought according to one of our indicator systems. This system does sometimes give false signals if a very strong trend is underway, but usually, it caps the market advances and declines pretty well. It is mainly used to further evaluate the potential risk/reward for positive or negative positions, at any given time. 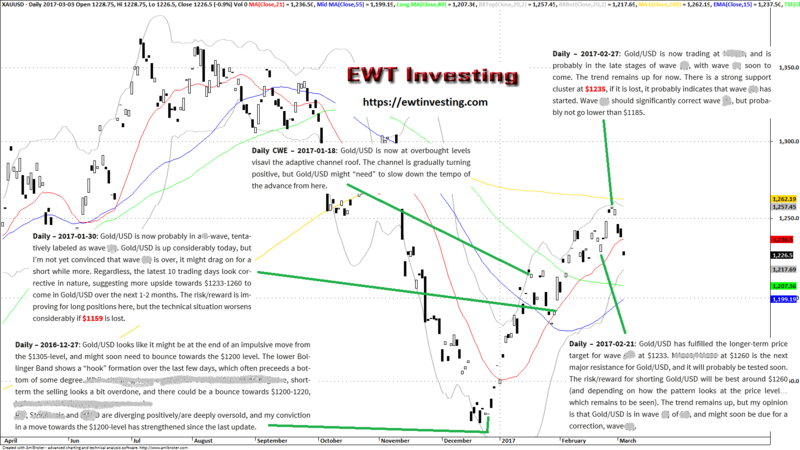 For all financial markets we analyze, we provide our subscribers with a special Daily chart with this indicator system. As is readily available from the chart, Gold/USD did start a fairly significant sideways correction at the time. On the 30th of January, the technical picture in Gold/USD cleared up even more, and issued a call for Gold/USD to trade to at least $1233 and at most $1260 over the next 1-2 months (the latter part of that prediction is yet to be fully borne out by the market though… we’ll see how it fares). Then on the 21st of February, in our update, we noted that $1233 had been hit, and that $1260 was next to probably be tested, and that shorting from that level would be appropriate. And again, on the 27th of February, just below $1260 in the Gold price series we use (it hit $1265~ish in the futures), we noted that while the trend did remain up, it was likely to end very soon – and the Gold/USD market has dropped since and broken several important supports. All in all, this was a series of very good Gold/USD calls on our part. 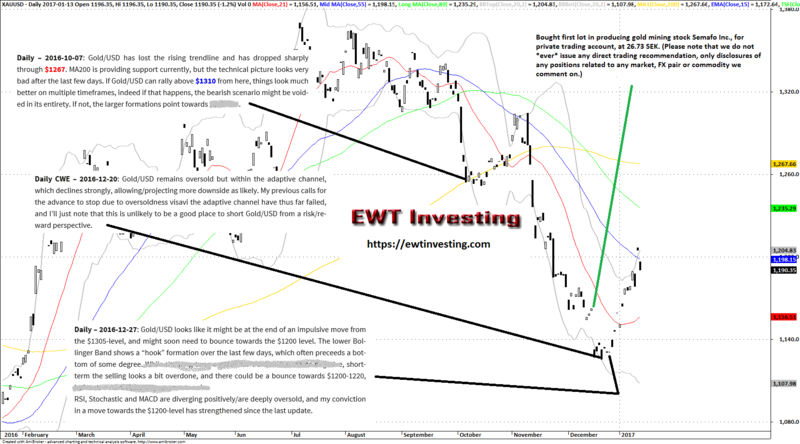 If you are interested in our Gold/USD analysis, you can get access to it (and currently 19 other financial market analysis sections) at only $19 per month (+possible VAT) through our Global Elliott Wave Coverage subscription service. We will accept a maximum number of 1000 members on this analysis service.